1 July-30 Sept. Buscot Park is home to the Faringdon Collection, which comprises a wealth of antiques and furniture and numbers among its paintings Burne-Jones's The Legend of the Briar Rose. A late 18th-century house, Buscot Park is known for its gardens including the Four Seasons walled garden, which was created by the present Lord Faringdon, while the Water Garden, one of Britain's finest, was designed by Harold Peto. 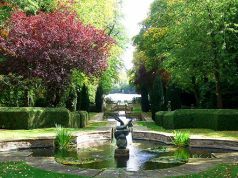 A mixture of Italianate gardens, mature woods and English parkland, combined with splendid views of the Thames plain, make Buscot Park a popular place to visit. Address Buscot Park, Faringdon, Oxfordshire, tel. 08453453387. Buscot Park, Faringdon, Oxfordshire, tel. 08453453387.